Welcome to our Sector Comparison Page. On this page we will select a specific sector on industry on the JSE and compare the share price performance of various shares listed within each of these sectors on an interactive graphic that allows readers to change the dates and the graphic then recalculates the share price returns based on the starting and end date supplied. The chart below shows the share price performance over the last 3 years for Vodacom, MTN and Blue Label Telecoms. And the returns do not look pretty. Especially for long term investors who were coining it with Blue Label until its recent slump has seen its gains made over the last couple of years wiped out in a matter of weeks. So a mixed bag of returns over various periods for the three shares listed. 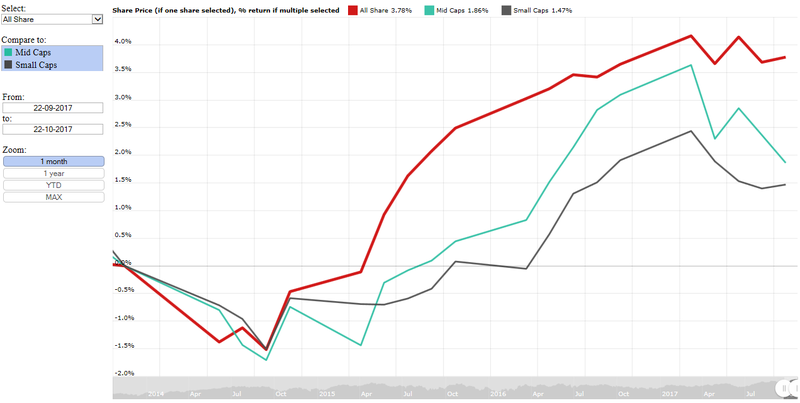 Over the last month Vodacom has provided the best returns, MTN second best and Blue label the worst returns. However over a 1 year period, MTN provided the best returns (even though it was a negative return, it was less negative than both Vodacom and Blue Label telecoms). And over a 3 year period MTN had by far the worst performance of the three companies, with Blue label telecoms have the second worst returns and Vodacom the best returns of the three companies (even though its returns over a three year period was still negative). The chart below shows some of the main listed construction companies in South Africa and their share price performance over the last 3 years. And it doesnt matter what time frame users select on the left hand side of the graphic, the returns from Group 5 is absolutely nothing to write home about. The fortunes of Murray and Roberts (MUR) and Stefanutti Stocks (SSK) shareholders are a little better for some of the time frames. Over the last 3 years, only MUR has given investors a positive return, while Aveng and Group 5 has lost investors almost all their money over a 3 year period. Below a few images showing the returns of the four above mentioned construction companies over the last 12 months and over the last 3 years. For those who dont know the above mentioned brands, brief summary's follow after which the share price history and performance of these companies over the last 10 years are looked at. McDonald's was founded in 1940 as a restaurant operated by Richard and Maurice McDonald, in San Bernardino, California, USA. They rechristened their business as a hamburger stand. The first time a McDonald's franchise used the Golden Arches logo was in 1953 at the opening of Phoenix, Arizona, USA. In 1955, Ray Kroc, a businessman, joined the company as a franchise agent and proceeded to purchase the chain from the McDonald brothers. McDonald's had it's original headquarters in Oak Brook, Illinois,USA, but has approved plans to move its global headquarters to Chicago by 2018. McDonald's remains one of the world's largest restaurant chains, serving over 69 million customers daily in over 100 countries across approximately 36,900 outlets as of 2016. Although McDonald's is known for its hamburgers, they also sell cheeseburgers, chicken products, french fries, breakfast items, soft drinks, milkshakes, wraps, and desserts. In response to changing consumer tastes and in response to negative backlash at towards the unhealthiness of their food, the company has added to its menu salads, fish, smoothies, and fruit. The McDonald's Corporation revenues come from the rent, royalties, and fees paid by the franchisees, as well as sales in company-operated restaurants. According to a BBC report published in 2012, McDonald's is the world's second largest private employer (behind Walmart with 1.9 million employees), 1.5 million of whom work for franchises. Yum! Brands, Inc., or Yum! and formerly Tricon Global Restaurants, Inc., is an American fast food company. A Fortune 500 corporation, Yum! operates the brands Taco Bell, KFC, Pizza Hut, and WingStreet worldwide, except in China, where the brands are operated by a separate company, Yum China. Prior to 2011, Yum! owned Long John Silver's and A&W Restaurants. Based in Louisville, Kentucky, it is one of the world's largest fast food restaurant companies in terms of system units—with 43,617 restaurants (including 2,859 that are company-owned and 40,758 that are franchised) around the world in over 135 countries and territories. According to the company's website "Starbucks is the premier roaster, marketer and retailer of specialty coffee in the world, operating in 68 countries. Formed in 1985, Starbucks Corporation’s common stock trades on the NASDAQ Global Select Market ("NASDAQ") under the symbol "SBUX." We purchase and roast high-quality coffees that we sell, along with handcrafted coffee, tea and other beverages and a variety of fresh food items, including snack offerings, through company-operated stores. We also sell a variety of coffee and tea products and license our trademarks through other channels such as licensed stores, grocery and foodservice accounts. In addition to our flagship Starbucks Coffee brand, we sell goods and services under the following brands: Teavana, Tazo, Seattle’s Best Coffee, Evolution Fresh, La Boulange and Ethos." Wendy's opened their first fast food burger outlet in 1969 in Columbus, Ohio. They listed in 1976 on the NASDAQ by 1978 they had 1000 stores open. In 1982 Wendy's was listed on the NYSE with the share code WEN. Come 2011 Wendy's moves back to listing in the NASDAQ. Wendy's currenly has 6 537 outlets open across the world. They have a market capital of $3.4billion and in 2016 average annual sales per restuarant in the USA amounted to $1.57million. Chipotle is a largely Mexican based grill fast food outlet based on the USA. According to their website "When Chipotle opened its first restaurant in 1993, the idea was simple: show that food served fast didn't have to be a “fast-food” experience. Using high-quality raw ingredients, classic cooking techniques, and distinctive interior design, we brought features from the realm of fine dining to the world of quick-service restaurants. Over 23 years later, our devotion to seeking out the very best ingredients we can--raised with respect for animals, farmers, and the environment--remains at the core of our commitment to Food With Integrity. And as we've grown, our mission has expanded to ensuring that better food is accessible to everyone." 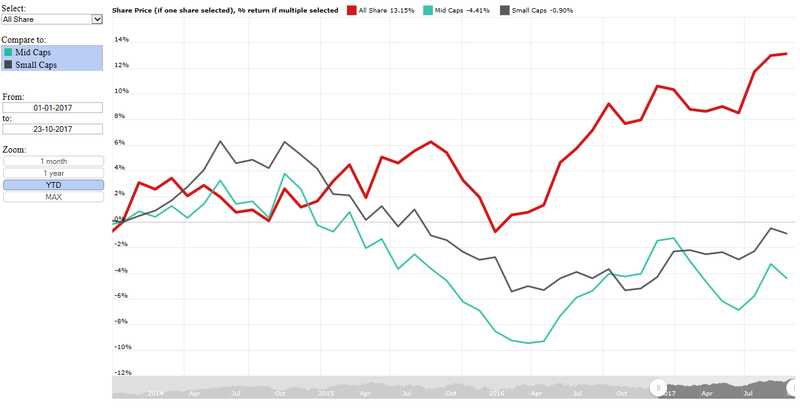 The interactive chart and images above clearly shows that investors would have been better served over the last couple of years by investing in the overall market instead of mid and small caps, as their returns are lower than the market average. However the ALSI has to a large extent been driven by the monster that is Naspers. In today's sector battle we take a loser look at the share price comparisons between listed groups active in the chemicals industry and their respective share price performances over time. We will look at Rolfes (RLF), Omnia (OMN) and SASOL (SOL). More details about each of these companies follows below with the graphic in which the share price performances are compared being shown right after the background of each of these companies. The Group manufactures and distributes a diverse range of market-leading, high-quality chemical and organic products to various industries. The Agricultural division develops, manufactures and distributes products that promote plant, root, and foliar health, soil nutrition, disease prevention and control and various other agricultural remedies. The Food division distributes imported and locally manufactured products to the food and beverage, bakery, dairy, pharmaceutical and cosmetics industries. The Industrial division manufactures and distributes industrial chemicals including various organic and inorganic products including additives, in-plant and point-of-sale dispersions, leather chemicals and solutions, solvents, lacquer thinners, pigments, surfactants, cleaning solvents, water treatment products, creosotes and waxes. The Water division provides specialised water purification solutions and products to the industrial, mining, home and personal care markets. Additionally, the division manufactures and distributes pure beneficiated silica to the mining, metallurgical, fertiliser, water filtration and construction industries. The Group’s international footprint and customer base extends to Asia, the rest of Africa, eastern and western Europe, with operations currently in Botswana, Zambia and Romania. Omnia Holdings Limited is a diversified chemicals group with specialised services and solutions for the agriculture, mining and chemicals industries. Using technical innovation combined with intellectual capital, Omnia adds value for customers at every stage of the supply and service chain. As a group, Omnia creates customer wealth by leveraging knowledge. Omnia differentiates itself from other commodity chemicals suppliers by applying the Group’s intellectual capital and technologies at all key points along its supply and service chains. This enables Omnia to create value throughout, by tailoring products and services to the specific and changing needs of its customers. The sustainability of the business model is strengthened by targeted backward integration through the installation of technologically advanced plants that manufacture core materials such as nitric acid and explosive emulsions. In addition to securing supply, this enables Omnia to improve operational efficiencies throughout the product development and production cycle. Since 1953, Omnia has had its roots in the fertilizer and agriculture industry and has built up an in-depth understanding, not only of its core markets in South Africa, but also in mining, manufucturing and agriculture in Africa. Based in Johannesburg, South Africa and with operations in 18 countries in Africa, including South Africa, and six countries outside of Africa, Omnia has more than six decades’ experience in the business. Additionally, Omnia continues to grow its global footprint, with business units in Australasia, Brazil, and regions such as Europe, South America and South East Asia. Omnia provides customised, knowledge-based solutions through its Agriculture, Mining and Chemicals divisions. These divisions include Omnia Fertilizer, Omnia Specialities, Bulk Mining Explosives (BME), Protea Mining Chemicals and Protea Chemicals, all niche businesses that operate with a common objective: to enhance customers’ businesses through research, development and knowledge sharing, that will enable them to increase profit margins. The business model has been tried and tested over many years, and continues to be fine-tuned as Omnia’s markets and customers evolve. Omnia sustains and grows the business by continuously enhancing the value it offers to local and international customers through product innovation, growing Omnia’s intellectual capital and working to further raise already exceptional service levels. A continuous feedback loop with customers at all points of engagement keeps the Omnia business model on track. Sasol is an international integrated chemicals and energy company that leverages technologies and the expertise of our 30 300 people working in 33 countries. We develop and commercialise technologies, and build and operate world-scale facilities to produce a range of high-value product stream, including liquid fuels, chemicals and low-carbon electricity. Sasol’s new value chain-based operating model came into effect in 2014. Towards this end, the Sasol Group is now organised into two upstream business units, three regional operating hubs, and four customer-facing strategic business units, supported by fit-for-purpose functions as reflected in our new Sasol website. Sasol’s focused and strong project pipeline means we are actively capitalising on the growth opportunities that play to our strengths in Southern Africa and North America. Our focus is creating value sustainably and we are proud to be taking this company, to new frontiers. Below the graphic comparing the share price performance of the above mentioned companies. As the date is changed the graphic recalculates the return based on the dates selected. In today's sector battle we take a loser look at the share price comparisons between listed groups with interest in private schooling/education. They are Curro (COH) and Advtech (ADH). Below a bit more detail regarding both companies and then the share price graphic comparing their share price performance over time. Curro has been a market darling over the last number of years, largely thanks to the backing of the PSG group (who backed little micro lender Capitec and turned them into a fully fledged bank shacking up the banking industry in South Africa). Below more details on Curro as provided on their website. Curro develops, acquires and manages independent schools in South Africa. Curro also provides educator training. Curro sees the written curriculum as fundamental to its offering and, if the taught curriculum aligns with the intentions of the written curriculum, successful learning takes place. Through its values, Curro creates a balanced educational arena in which many co-curricular activities, such as sport and culture can be enjoyed by learners whilst not losing sight of the core essence of a typical school, namely successful learning. Curro schools accommodate learners from the ages of 3 months to grade 12. Class sizes are limited to a maximum of 25 learners per class and the IEB (Independent Examinations Board) examination is written at the end of Grade 12. These co-ed schools are traditionally parallel-medium (Afrikaans and English) from Group 4 to Grade 9 and dual medium from Grade 10 to Grade 12. Naturally, a wide subject choice is offered in the FET phase (Grade 10 to Grade 12). These schools have excellent facilities and offer all the co-curricular activities one would have expected in the ex-model C schools. School fees are kept affordable. A typical campus will accommodate 1 200 to 2 000 learners. Meridian schools and Curro Academy schools accommodate learners from the age of five years to Grade 12 (Meridian Pinehurst from age 3 months). Classes accommodate up to 35 learners and these schools write the National Senior Certificate (NSC) examination at the end of Grade 12. Subject choices are focussed and tuition at these co-ed schools is single medium (English). Co-curricular activities are offered, but these are limited. This is a very cost-conscious model. A fully developed campus will accommodate 1 500 to 4 000 learners. Hostel accommodation will be a feature at these schools. Curro Select schools were ordinarily added to the Curro group of schools as acquisitions, after which these schools retain their original well-established identities and ethos. The medium of tuition is English complemented by superior facilities and a rich heritage, tradition and good academic and co-curricular results. These schools are more expensive, with a wide variety of curricular and co-curricular activities on offer. The campus size varies from school to school, but generally they are situated on 10 to 15 hectares and accommodate from 1 400 to 2 000 learners. Curro Castles are nursery schools for learners from 3 months up to 5 years old and can accommodate up to 300 children. Advtech owns various private schools group. COH made an audacious offer for AdvTech earlier in the year, below details regarding some of their private schools. CrawfordSchools™ has 19 schools across Gauteng and KZN, that includes Pre-Primary, Preparatory and College students. Crawford is a progressive educational institution and provides opportunities for students to thrive as individuals and succeed in the 21st Century. They provide opportunities and resources that encourage students to excel in academic, sports, cultural and social activities. Trinityhouse is founded on time honoured traditional values and comprises a Pre-Primary, Preparatory and High school. Its students are offered a healthy balance of academic, sports and cultural activities within a structured, secure and disciplined environment that is shaped by a strong Christian ethos. Abbotts College focuses on the final years of schooling and caters exclusively for Grade 10, 11 and 12 students. The College recognises the individual needs of its students and uses unique methods and systems to develop their full academic potential in an inclusive, caring and focused environment. Centurus Colleges is a family of three independent, combined, co-educational schools providing superior education services and development programmes for children of varied abilities. Junior Colleges is a nurturing group of nursery schools that provide for the holistic development of children from the age of six weeks to six years within a 'home away from home' environment. ​Maravest is a private company investing in Pre-, Primary and High schools. The group focuses on excellence in education with a Christian ethos. The slogan: "Investing in the education of our future", establishes that we can influence the children we have in our classrooms today, but also set them up for the future tomorrow. ​The aim of ADvTE​CH Academies is to service the educational needs of various communities through a quality educational offering. Due to its focus on the community, various types of schools following diverse curricula can be accommodated. In addition to providing a stable of stand-alone schools' brands, ADvTECH Academies also acts as an incubator to nurture brands with potential for growth. The Independent Institute of Education (IIE) was registered by the Department of Higher Education and Training in 2007 as the higher education provider of the Group. From a regulatory point of view the tertiary brands are part of The Independent Institute of Education which is now the largest private provider of higher education in the country. professionals in their respective fields, but do so in an affordable manner offering quality education that produces prepared professionals who are ready to enter the world of work straight after graduation. Rosebank College has made it its priority to produce highly employable graduates who have the knowledge, skills, competence and confidence they need to become valued assets within an organisation. Vega, an educational brand of the Independent Institute of Education, believes that brands are the world's greatest assets for meaningful change. Vega graduates multi-disciplinary collaborators able to solve complex challenges, by delivering fully accredited Certificates, Baccalaureates, Honours and Masters programmes in brand building, creative communication, photography and business management. Design School Southern Africa's educational training in graphic, fashion and interior design delivers design knowledge and experience that unlocks students' individual creative potential and shapes well-rounded, accountable, industry-ready designers. DSSA provides full-time undergraduate degrees and part-time courses in design and is an Autodesk and Lectra accredited training centre. DSSA is a key division of The Independent Institute of Education (The IIE), which is the country's largest, most accredited provider of private higher education. Varsity College’s mediated approach to a blended learning and teaching experience, together with their student support and development programmes, provide an environment for students to maximise their learning potential. Higher education programmes that integrate theory and practice, coupled with an emphasis on the development of life and personal skills, prepare students for employment after graduation. Varsity College offers a range of accredited full-time IIE qualifications in the faculties of Commerce, Humanities, Social Sciences and Information and Communication Technology, as well as a range of part-time qualifications and short learning programmes that provide opportunities for adults to progress in their careers. The Business School at Varsity College offers ambitious working adults the opportunity to build on their skills with convenient part-time study. You can choose from a variety of world class programmes, that won’t impact on your work hours. Many of our lecturers maintain full time jobs in between lecturing at The Business School. The subjects they teach are also usually what they do for a living. So, they are able to provide real-world experience first-hand. This is in line with The Business School’s approach to adult learning, which utilises both theory and practical application. Capsicum Culinary Studio prides itself on offering high-quality culinary education for aspiring chefs. Students are provided with an education that equips them to work anywhere in the world with the internationally approved City & Guilds (UK) courses. Capsicum provides full and part-time Diploma and Certificate culinary courses at all six campuses countrywide that are supported by a commitment to academic excellence in culinary education. Students enjoy a thriving student life, hands-on experience in the training kitchens under the close guidance of highly qualified chef lecturers and industry experience during their studies. The Private Hotel School is a private higher education institution, based in Stellenbosch - the heart of the Cape Winelands and with award-winning restaurants and hotels on its doorstep. The curriculum combines innovative and leading edge academic and practical training and creates a strong foundation for successful careers in the dynamic hospitality and tourism industries.